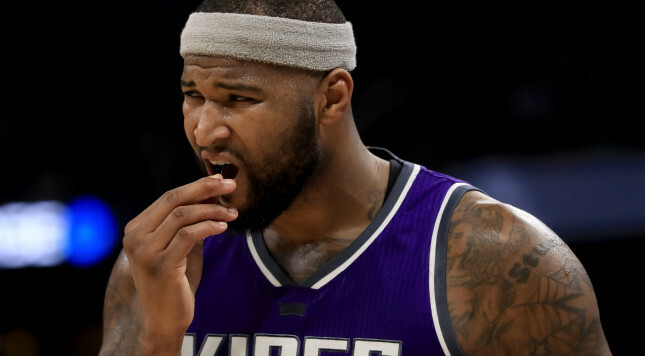 DeMarcus Cousins is one of the hottest names being brought up in NBA trade rumors. He has been rumored to be available for the better part of two years, but the Sacramento Kings have never pulled the trigger on a deal involving him. That might change at some point this season. According to a report from Bleacher Report, one NBA executive believes that the Kings will end up trading Cousins to the Boston Celtics at some point in the future. The report says that the trade “makes too much sense” not to end up happening at some point. Boston has been very open about their desire to acquire another star to put alongside of Isaiah Thomas and Al Horford. If they were able to bring in Cousins, that would be a huge step towards competing for a championship. Bringing in that kind of talent would certainly make them the top contenders for the Cleveland Cavaliers to deal with in the Eastern Conference. Cousins has become one of the elite stars in the NBA over the past couple of seasons. He is widely viewed as the best big man in the NBA at this point in time. Throughout the course of the 2016-17 season thus far, Cousins has averaged 26.6 points and 9.3 rebounds per game. He has shot 47.7 percent from the field overall and knocked down 30.8 percent of his three-point attempts. Trading him won’t be easy for the Kings, but he likely won’t stick with them long-term after his current contract is up. At just 26-years-old, Cousins is going to command an incredibly high price for any team that acquires him. If there is a team that has the necessary young players and picks to move, it would be Boston. Danny Ainge has been extremely aggressive over the last couple of years. He has yet to pull off the blockbuster trade that he has wanted, but has been connected to names like Anthony Davis and Blake Griffin in addition to Cousins. If he could bring Cousins on board, Brad Stevens would be the happiest coach in the world. All of that being said, it will be interesting to see what the Kings end up doing with Cousins. It is far from a sure thing that they will actually trade him. They would be wise to get a hefty package in return for the star big man, but they may choose to test their luck with him and try to continue building around him and get him locked up to a new contract when his ends following next season. Expect to continue hearing Cousins’ name come up in trade rumors moving forward. Sacramento isn’t going to deal him just to make a move, but an aggressive trade offer from a team like the Celtics might just make them consider making a deal.